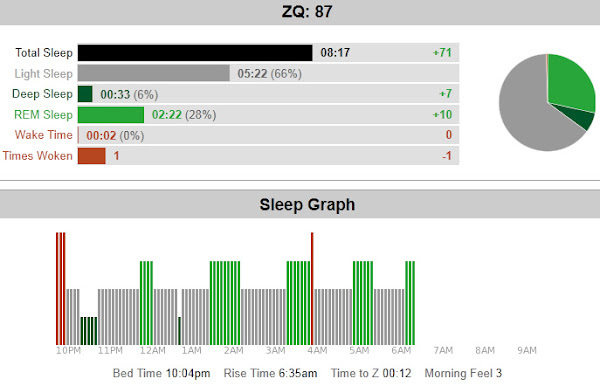 The chart above depicts an ideal night of sleeping as captured by the Zeo Sleep Manager. The sleep score of 87 is well above the national average of 80. I was able to sleep just over 8 hours which is in the recommended 7 to 8 hours of sleep per night everyone hears about as a rule of thumb. I was also only up once, presumably to hit the bathroom so for the most part, I slept un-interrupted through the majority of the night. Graphically, you can see that I had a pretty consistent sleep cycle of light sleep/REM sleep. The only item that could use some improvement is increasing the amount of time in Deep Sleep but that’s a deeper topic. The chart above is from the night of Sunday, August 14th. That morning I did a 12.5 mile mixed pace run on a treadmill whereby the first 30 minutes was done at a Z2 pace, 60 minutes at Z2 with every 5th minute at Z4, then wrapping up with a 15 minute marathon pace tempo. Later in the day, around 5pm, I did another 5 mile run at Z2 pace. I was pretty spent by the end of the 5 mile run and it really showed with sleep. Theoretically, I slept just over 7 hours which is a decent night but was really asleep for only 6:35 according to the Zeo Sleep Manager. Right off the bat, you can see that I was never really able to get into a decent sleeping pattern which I’d attribute to soreness/lots of tossing and turning as evidenced by 78% Light Sleep and completely waking up 4 times. I barely had any Deep Sleep and REM sleep was cut by more than half over an ideal night of sleep. I’m not sure how to address the tossing and turning from feeling sore but the easy takeaway here is if you have a hard workout the day before, you really need to account for extra sleep to fully recover. The last example is an interesting one. I somehow managed to slip on the Zeo headband before I passed out after a hard night of drinking. I don’t remember exactly what I drank or how how much but give me a break, I was drunk. Although I passed out/fell asleep at 2:44am, I managed to sleep until exactly 9am, which was probably an alarm I had set. 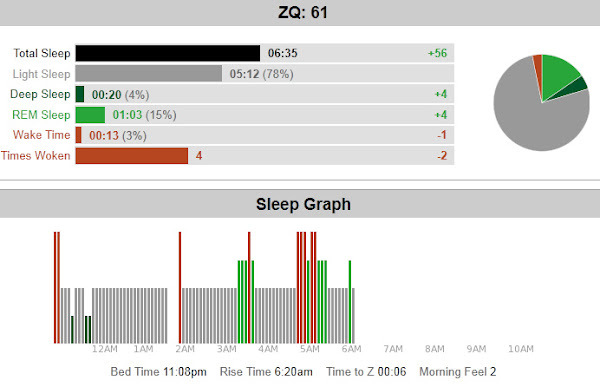 The interesting piece is that although I slept less overall (5:43) compared to the night where I was fatigued from running (6:35), The ZQ score was higher on the drunk sleep night (63 vs 61). The primary reason being that 34% of the time being asleep was quality sleep (Deep + REM) versus just 19% on the fatigued night. 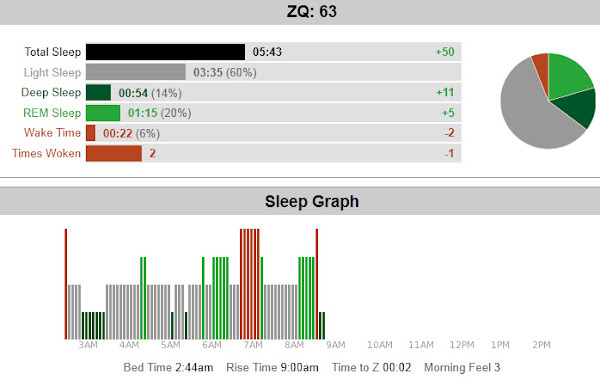 Graphically, the Zeo Sleep Manager reporting did show some resemblance of a sleeping cycle on the Drunk Sleep. The main difference is that large block of Deep Sleep that occurred shortly after passing out. I’m not sure if that’s because of the alcohol but it maybe an explanation. I’d have to note that for this particular night, I didn’t wake up the next morning feeling terribly hungover. Maybe a bit sluggish, but definitely not sick. I think this may have factored into the quality of sleep. It is tough to say that drunk sleep is better than fatigued sleep through one example but it is an interesting comparison. Great blog post and thanks for sharing it on Facebook! I really enjoyed the data shots that you provided. It's always fascinating to see how an individual's sleep is affected by what they do during the day. Best wishes on your continued journey; looking forward to reading more. Well, I consider alcohol the worse way of relaxation. Still, a very interesting blog you have here. As for me, I'm running a blog about data room software at the moment. A proper night's sleep is absolutely essential for our long-term health and mental well-being. But getting enough sleep - and sleep of the best quality - is a requirement we often fail to meet. Taking sleeping pills is both addictive and dangerous, while simple breathing or mental exercises just aren't effective for most of us. Sleep meditation, however, can guide us down to a deep sleep amazingly well because it works in harmony with our natural Sleep Tracker app. The timing of sleep during the day is governed by the circadian rhythm, a kind of natural inner clock which influences hormone levels and body temperature. All too often, it is the process of falling asleep in the first place that is problematic. We just can't seem to switch off, and the difficulty tends to be greatest at stressful times in our lives when we least need to have this problem! Pills and alcohol are two crude ways of trying to fall asleep, but they entail their own long-term effects, and can interfere with our natural sleep number. Nightmares, for example, are much more likely when alcohol is used, as REM sleep is suppressed in the early cycles until the alcohol has worn off; after this, the brain has a lot of "catching up" to do and this tends to result in extremely vivid dream imagery. A well-engineered sleep-meditation recording exposes the brain to periods of each frequency associated with falling asleep, taking you gradually down through Alpha and Theta and eventually into the deep sleep of Delta. It is this Delta state that we most need to reach, for it is here that the body's repair mechanisms kick into high gear, releasing anti-aging and growth hormones and even stimulating the regeneration of cellular DNA. And the first Sleep Tracker - the one we have the most trouble falling into - is where the deepest Delta sleep occurs. While traditional meditation can help you fall asleep, it cannot continue to encourage your brain to resonate at the Delta frequency in the way that a sleep meditation recording can.